View and search this newspaper by clicking on the Chronicling America link below. This newspaper comes from the collections of the Kansas Historical Society and was digitized with funds from the National Endowment for the Humanities as part of the National Digital Newspaper Program. The White Cloud Kansas Chief was made notable by its founder and editor, Sol (Solomon) Miller, a pioneer of Kansas newspaper publishing. Founded in a time when most newspapers lasted a few years at most, Miller published the Chief for nearly forty years. 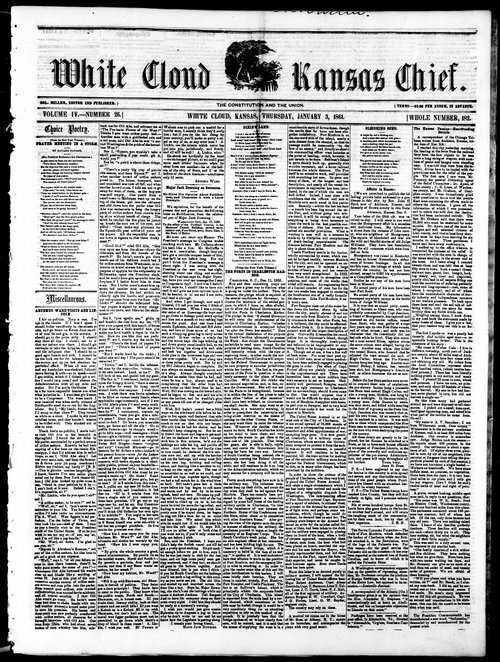 Shortly after arriving in White Cloud, Kansas Territory, Miller issued the first edition of the White Cloud Kansas Chief on June 4, 1857.